List Seasonique side effects by likelihood and severity. Before using this medication, tell your doctor or pharmacist your medical history, especially of: blood clots (for example, in the legs, eyes, lungs), blood clotting disorders (such as protein C or protein S deficiency), high blood pressure, abnormal breast exam, cancer (especially endometrial or breast cancer), high cholesterol or triglyceride (blood fat) levels, depression, diabetes, family medical history (especially angioedema), gallbladder problems, severe headaches/migraines, heart problems (such as heart valve disease, irregular heartbeat, previous heart attack), history of yellowing eyes/skin (jaundice) during pregnancy or while using hormonal birth control (such as pills, patch), kidney disease, liver disease (including tumors), stroke, swelling (edema), thyroid problems, unexplained vaginal bleeding. 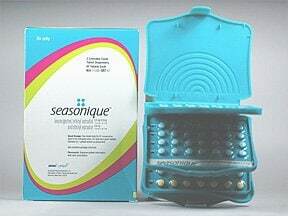 Some products that may interact with this drug include: aromatase inhibitors (such as anastrozole, exemestane), ospemifene, tamoxifen, tizanidine, tranexamic acid, certain combination products used to treat chronic hepatitis C (ombitasvir/paritaprevir/ritonavir with or without dasabuvir). Does Seasonique interact with other medications? Should I avoid certain foods while taking Seasonique? 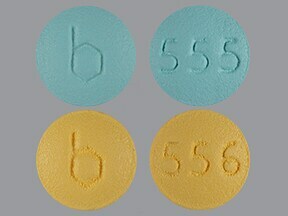 This medicine is a multi-color (2), round, film-coated, dose pack imprinted with "B" and "555 or 556". Are you considering switching to Seasonique? How long have you been taking Seasonique?